I heard about this place from a couple of friends and was eager to check it out. As one of my Indian friends put it, "All the egg stuff you have in India after you are drunk, before you go home, from a guy who makes this stuff from a small cart . . . everyone stops -- taxi drivers to the richest dudes." Well, that was enough for me and a two-part plan immediately came to mind. Pretty much everything we tried was new to me and, for the most part, it was awesome. It was just a whole new world of bold, spicy, rich dishes that are the perfect follow-up for a couple of rounds of cocktails. Showing two local locations. I don't know from Schaumburg, though it appears that is Location #1. 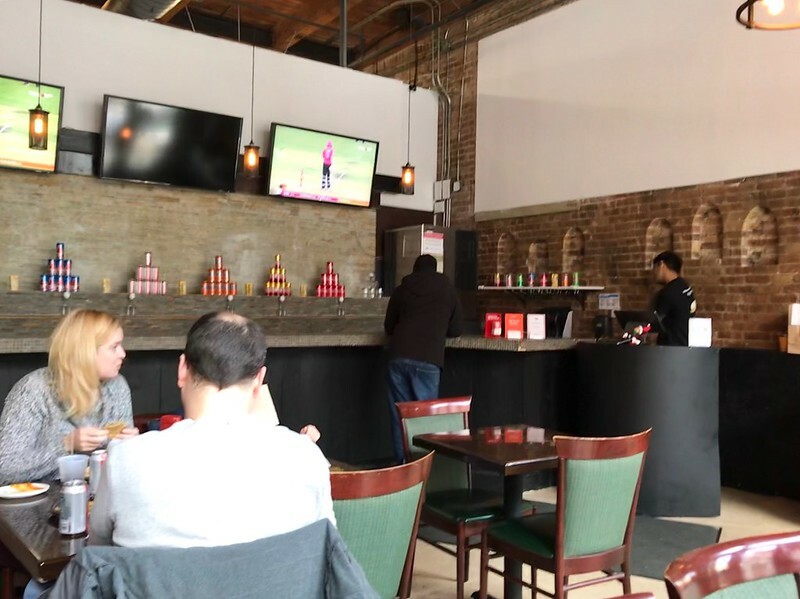 We were at the Chicago Avenue location in River West. OMG - was that a googly!? Extremely intense, with a fair amount of what I think was raw (or very lightly cooked) garlic and onion. An eye-opener. Wonderfully rich and flavorful. We were instructed to mix the eggs in from the outset. A choice of roti or white bread accompanies many of the dishes. Unlike any other sandwich I've ever had. A great combination of flavors. The masala was intense and since we'd ordered it spicy, there were large strips of raw jalapeno on it. Probably my favorite dish. Just a beautifully rich, intense, spicy and flavorful plate of deliciousness. This one was recommended by our server. 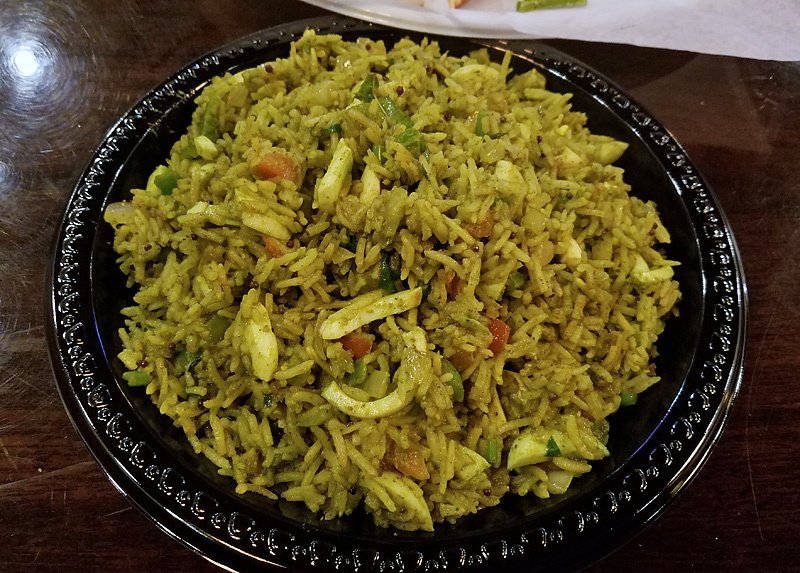 It was sort of mash-up between fried rice and breakfast biryani. Out of sight! I loved this one so much, I pretty much inhaled it without chewing. These are not Bubbe Suburban's scrambled eggs! A crazily intense digestive, with flavors of rose petal jam, desiccated coconut and dried fruit (wrapped in a betel leaf), served cold, at the end of the meal. We didn't order these but they brought them out for us because, I'm guessing, we looked like we really needed them. We did. Also, when it appeared clear that the level of heat was just too much for one of my companions, a mango lassi was rushed out to her by the incredibly friendly staff. We weren't charged for this, either. Really cool of these folks. The menu is large, and we left a lot of it unexplored. I'm excited to return soon (and regularly) and try more of it. And, as I mentioned, the staff could not have been friendlier. Loved my first visit here tonight! 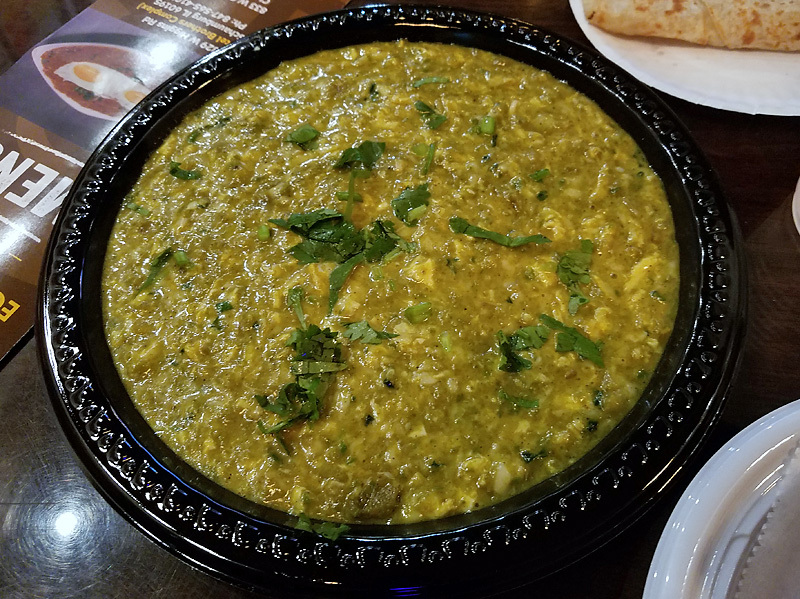 Between two of us (and a tyke) we were only able to order a truncated sampling of the feast Ronnie posted above– anda masala (the double decker grilled cheese thing), surti gotalo (the egg curry topped with runny eggs), and green egg rice. It was all delicious, fresh, and packed with spice. The sando worked better than it should have, more reminiscent of a club, but with curried eggs. The roti on the side was very good as well. This place is a gift to our vegetarian brethren & sistren. A bright, clean space, helpful (counter) service, kid friendly, pungent chai– Egg-o-holic, count me a fan! Oh, and this being Dryuary, I was sober and still loved the food! Thanks for writing about this, Ronnie. I have eaten some of this in India, but there were a lot of things that were new to me. Especially the Gotala and the Lachko. I loved it and will be back as many times as I can, as this is something that I did not know was missing from my life. First the goods: The place is clean, bright, airy. 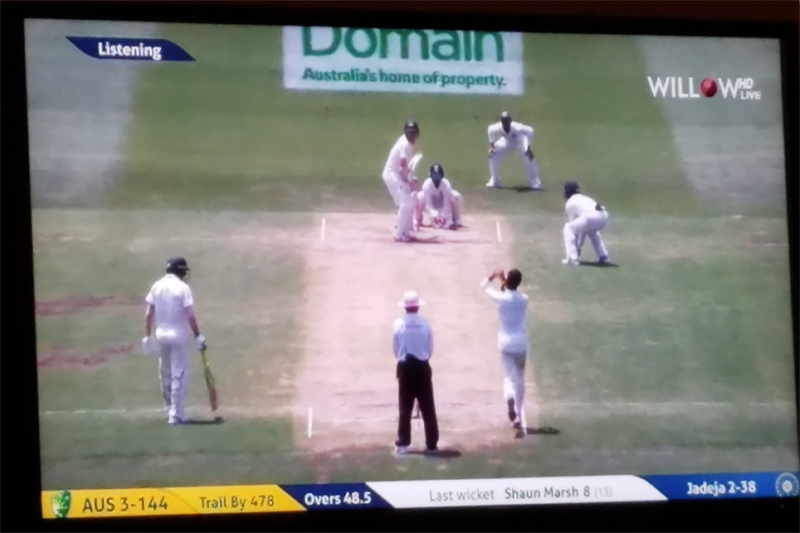 They have CRICKET on the screen and that makes me inordinately happy. They have a really wide menu for an ovo-lacto-vegetarian like me. The prices are reasonable. Now, the lachko that I ordered was really tasty, when consumed with either Chapati or Rice. On its own it was a bit too salty. I think the restaurant would do well to undersalt the egg dishes, so consumers can salt to their taste. I talked to the kid running the till, talked about how I heard about this on LTH and asked him to look it up. Ronnie, the kid remembered you!! He said you were complimentary of the food and remembered that you guys ordered a bunch of stuff, "for only two people"! 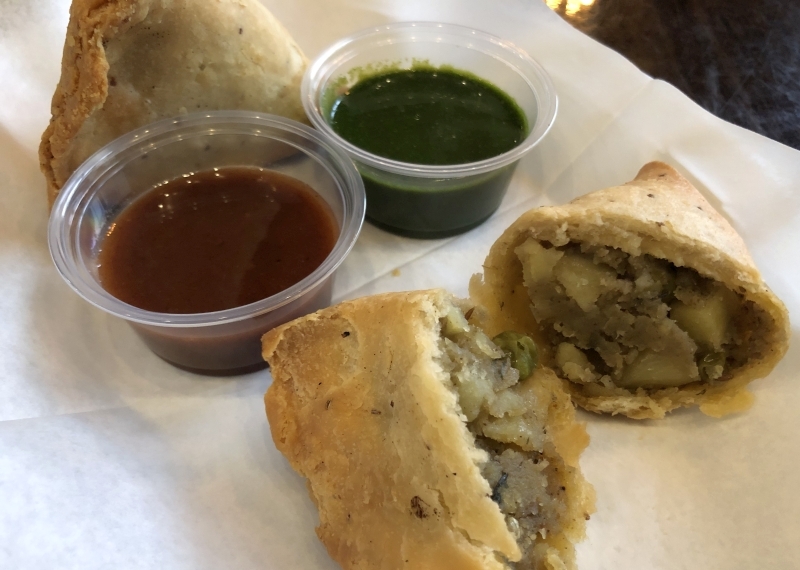 I am glad it is something I do not have to schlep to the suburbs to have, unlike good Regional Indian food, which is woefully underrepresented in the City proper. I hope they do well in that location. It is kinda off the track and they are doing a bad job advertising this as "Indian Cuisine". It is technically correct; but this should be called "Indian Truck-Stop Food" or "Indian Truck-Driver food" or something like that to let people know that this is not a 'typical' Indian place. Indianbadger wrote: I am glad it is something I do not have to schlep to the suburbs to have, unlike good Regional Indian food, which is woefully underrepresented in the City proper. I'd be very interested in where you "schlep to" in the suburbs to have good Regional Indian food. So as not to clutter this thread there is one thread I found, there may be more. Indian and other ethnic in the northern suburbs or start a new one. There is also the 7 Spices thread where that was split from. Thanks in advance. I'm super excited to try Egg-A-Holic and will in the coming week. I made my maiden voyage here on Wednesday. Two of us ordered Bhurji Palav, Lachko and Toofani Curry. We loved the lachko (and did not find it remotely salty). The Toofani consisted of slices of nicely cooked hard boiled egg in a spicy red gravy. The gravy was fairly runny and this dish would have been difficult to finish except that it made a great topping for the Bhurji Palav, which seemed very bland compared to the other two dishes and benefited greatly from the addition of the Toofani gravy. Since I couldn't stopped thinking about the Lachko, I went back this morning and got another to go. 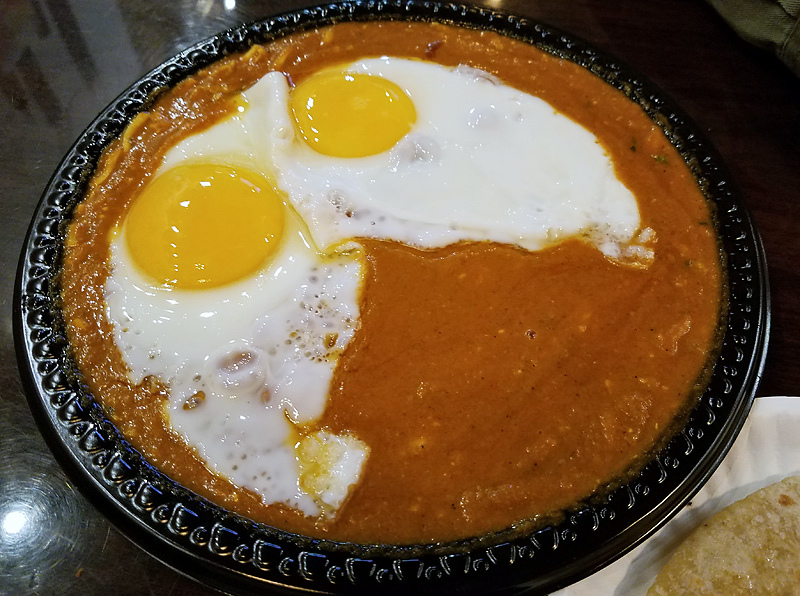 In addition, I added an Egg Curry to my order, which was also excellent. While the roti provided with the dishes is fine, I made some basmati rice at home to serve as a base for the eggs. This place is excellent and I will be surprised if another week goes by without seeing me there again. We had a great meal here last week — thanks for posting about this place, Ronnie. The lachko is a must-order I think (their most popular dish, apparently) and as Jefe says, even the masala chai is above average. For sure adding this to the downtown repertoire. Indianbadger wrote: I hope they do well in that location. It is kinda off the track and they are doing a bad job advertising this as "Indian Cuisine". It is technically correct; but this should be called "Indian Truck-Stop Food" or "Indian Truck-Driver food" or something like that to let people know that this is not a 'typical' Indian place. I was going to link to Sula's stellar, informative piece, too. He is actually one of the friends who clued me in about this place, so credit where credit is due. In fact, I think the only reason my post went up before his is because I was able to come home and just post about it. I think there's a longer process for the Pros. Went for a "late" Sunday morning breakfast (they don't open until 11:00am , but are considering expanding their hours!) and was overwhelmingly HAPPY! The food is amazing!- unlike any Indian Food I've ever had in Chicago. Friendly, warm room- although, parking was a challenge, due to a Church Worship across the street where a famous Chicago Nightclub (KA-BOOM!) used to be. Their Chai was very "spicy"- black pepper and cardamon were strongly present, and was already presweetened. especially if you are a egg-eating-Vegetarian.....what a unique combination of flavors. Count me a fan as Gary Wivott, is prone to pronounce! I'll-be-back- as Arnold would assert. I neglected to give credit to Da Beef for discovering this place. He posted about it on Smokin' Chokin' and Chowing with the King some time around December 14 after he visited the Schaumberg location. Thanks for finding this place, and so many others. Your site and your contributions to this board are incredibly generous. Haha, of course. I should have figured. All roads lead to Da Beef! Btw, in case anyone is interested, there will a group meal here on Sunday February 3 at 6:00. It's a meeting of the Small Household Food Exchange but all are welcome. If you like eggs and don't care for American football, this could be a perfect opportunity to check it out. Click here for more information. ronnie_suburban wrote: Btw, in case anyone is interested, there will a group meal here on Sunday February 3 at 6:00. It's a meeting of the Small Household Food Exchange but all are welcome. If you like eggs and don't care for American football, this could be a perfect opportunity to check it out. Click here for more information. Duly noted. I've updated the Events sidebar. 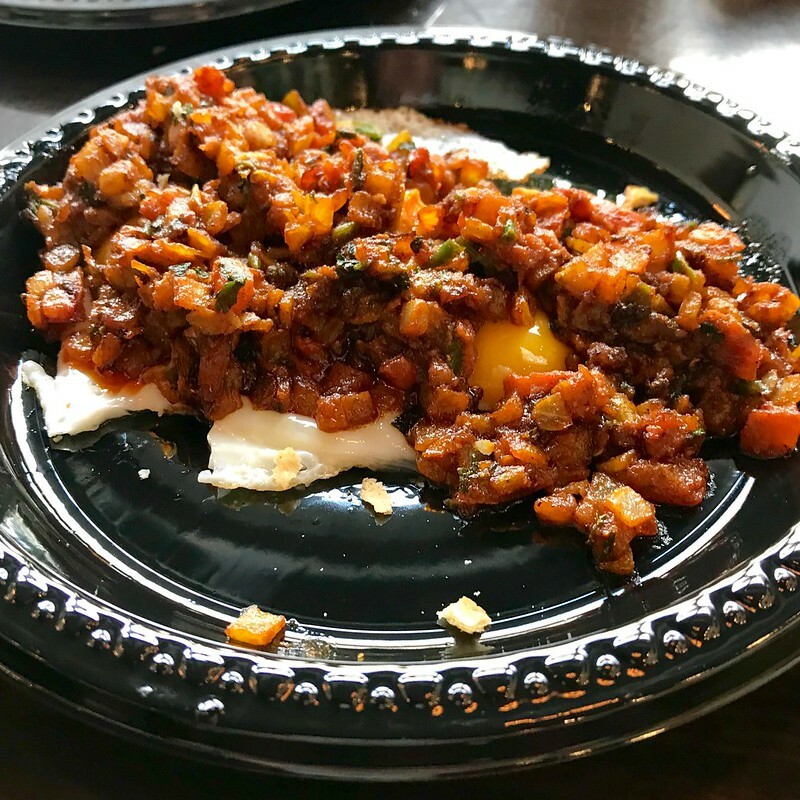 Want to eat something for "breakfast"- unlike any egg dish you've EVER had before in your life? As I mentioned before their Chai is wonderfully spiced and sweetened, and the crowd both times we've gone is mostly of Indian descent (I note this because if an ethnic restaurant fails to attract it's own peeps- then it's not really- that good/authentic-(IMHO). "This unusual rum-based liqueur hints at exotic cardamom, almond and rosewater. It’s creamy but light, and would be a palate-cleansing way to end a richly spiced meal. The ornate gold and red bottle is an eye-catcher, too. Sip it or try the producer’s recommendation to serve frozen into a 'kulfsicle.'"" Egg-o-holic is a truly unique Gujarati-style Egg-centric-Street-Food-place, that's made me (& my South Indian better-half) VERY happy to discover. Color me impressed by Egg-A-Holic with a few reservations. The chai was the best I can remember with the soul-warming comfort of homemade hot chocolate (with the scalded milk skin to prove it) and whole-spice flavor. The greaseless samosas were perfection on this visit, fragrant and not oversalted and with crust I'd rank alongside Pleasant House, almost architectural in nature. 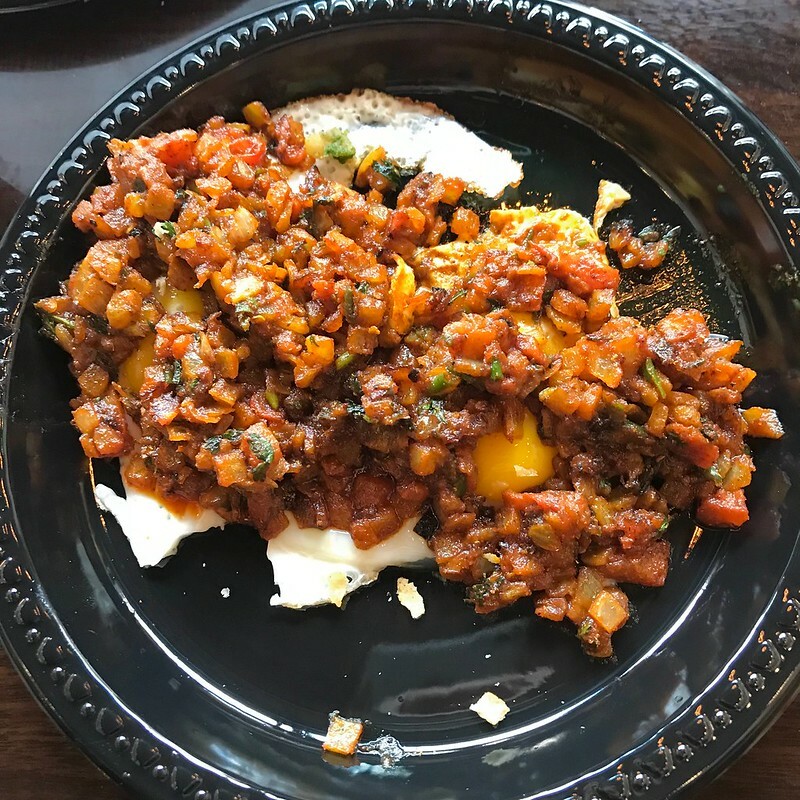 I ordered Ron's aforepictured egg bhurji (clearly enunciated and pointed to on the menu) and instead received pav bhaji, which while excellent for what it was could only be as good as pav bhaji gets (I feel the same way about katsudon and slingers / horseshoes, dousing any textural contrast - YMMV). Heavily gravied on a wide plate, it lost specific heat quickly and was not spicy or herbal, just rich. The accompanying small roti (one included, with traditional soft bread as an alternative, more extra) was stellar. 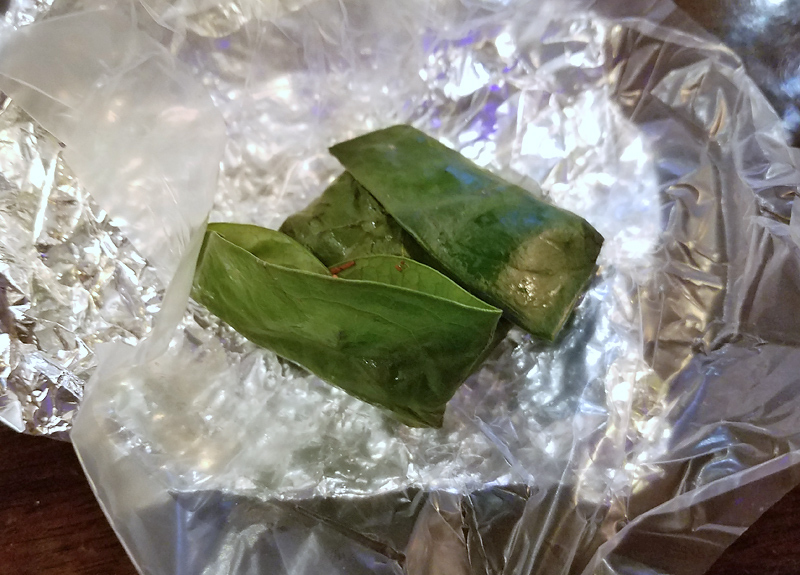 My portion of paan had foil shreds and one small ball of foil within the betel leaf, a non-starter. Aficionados will know to unwrap and check pre-portioned paan (this was pre-chilled and assembled) before masticating in case there is tobacco or nut stems which one may prefer not to digest, and I'm glad I did since I'm one of those who eventually consumes the whole packet. This was the real deal, stimulating and flavorful and not cloying, but would have been decidedly unpleasant unchecked - I'll give them another try on this but do recommend the roving customizable stations at the cabbie joints to those curious. I will probably get smacked down for being negative again, but I left unimpressed with the lachko. It was tasty. But in the end it was rich, greasy, cheesy, slightly overseasoned scrambled eggs served on plastic plates. Except I paid $12 (after tax) and had to wait at least 15 minutes for it to arrive and left somewhat hungry. This seems antithetical to the concept of bringing street food to the States. Admittedly there is more of the menu I want to explore and more of it seems reasonably priced and the lachko certainly didn't taste bad. botd wrote: I will probably get smacked down for being negative again, but I left unimpressed with the lachko. It was tasty. But in the end it was rich, greasy, cheesy, slightly overseasoned scrambled eggs served on plastic plates. Except I paid $12 (after tax) and had to wait at least 15 minutes for it to arrive and left somewhat hungry. You must have a big appetite! I solo ordered just the lachko for lunch today and could only get through about 2/3 of it! Damn is it rich, cheesy as you describe. 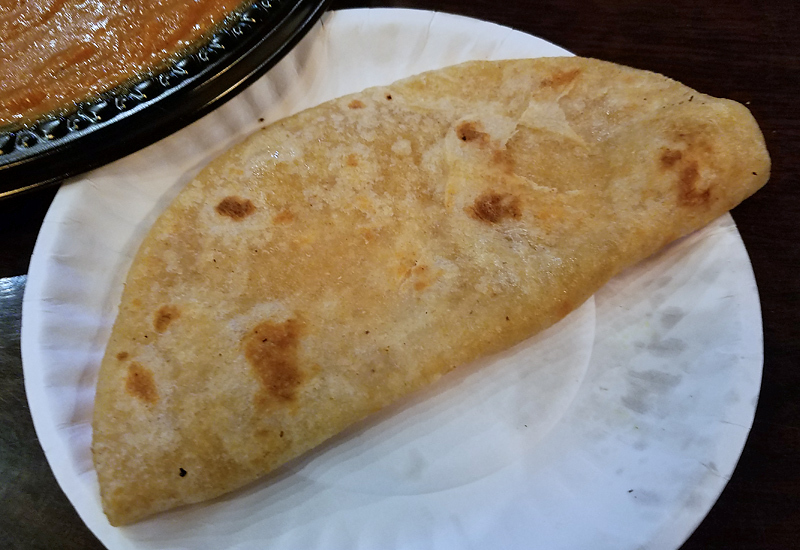 After I polished off my roti (note: one flat bread is very skimpy relative to the portion size) I wished I had some chips, since this dish almost eats like Indian queso. And yeah kinda pricy, but calorie for calorie maybe worth it. The lachko was very good on top of basmati rice. I might recommend an order of basmati off the menu as a side dish next time. The chai was the best I can remember with the soul-warming comfort of homemade hot chocolate (with the scalded milk skin to prove it) and whole-spice flavor. 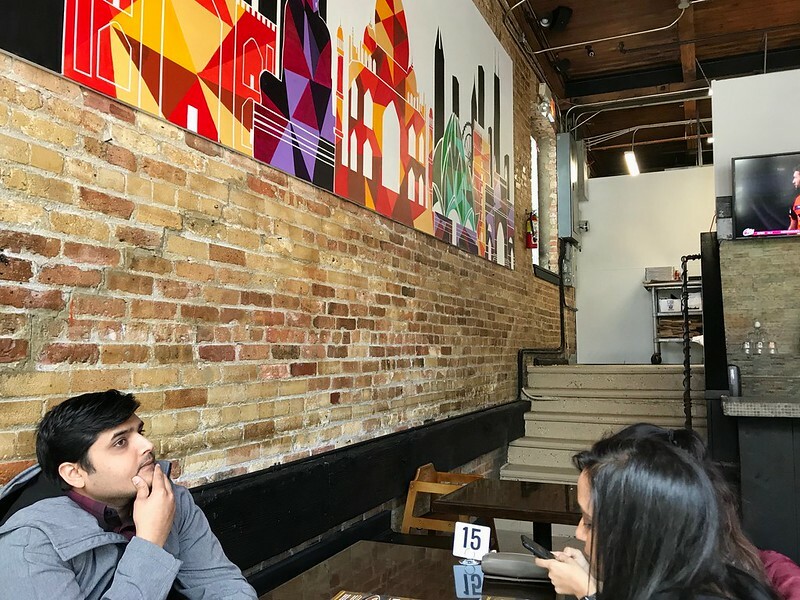 ....and further note that the bad experience he had with "Pan"- (which is truly-an acquired taste at best........) should not color his judgement of this amazing new Chicago-Desi-breakfast joint. Rare- that I have a restaurant/or joint occupy that much space in my brain......as Egg-O-holic has. So far the dishes I've had- have been amazing. The small household food exchange went to the Schaumburg location of Egg-O-Holic on April 3. Adequate parking, but not necessarily easy as it shares the lot with the HUGE Patel Brothers supermarket. Nine people shared a many dishes, ordering multiples of some of them. I am glad I went, some dishes were different and interesting, but I doubt I'll ever go back. Warning: this is fast food, everything served on disposable plastic plates, with plastic tableware and pop up napkins on table (take to rest room if you don't like blow dryers). At least the men's room should be visited, I have an open question with the moderators as to whether I should post a photo. After the first few dishes, food came fast and furious, and especially those delivered to the other end of the table I don't know which is which. Even at our end we had to ask and sometimes got a different answer the second time we asked. LTH won't let me attach any more pictures, so I'll guess 10 is a limit (or number of bytes), and post rest in another entry. Last edited by diversedancer on February 4th, 2019, 10:50 pm, edited 2 times in total. Winners and losers: I liked the Lachko, which was recommended by the OP, and the green egg curry. I don't think anybody else at my end of the table did more than taste the one with two sunnyside up eggs (Egg Bhaji? ), and about half was left at the other end of the table, nobody there wanted to take it home. Is it just fear of the not fully cooked egg, or something else? I thought the flavor comparable to other items. One last comment, I was surprised the bill was only $22.50 per person. If it turns out an error was made, let me know and I will make good for my share. diversedancer wrote: I don't think anybody else at my end of the table did more than taste the one with two sunnyside up eggs (Egg Bhaji? ), and about half was left at the other end of the table, nobody there wanted to take it home. Is it just fear of the not fully cooked egg, or something else? I thought the flavor comparable to other items. I think you jump to conclusions on why we offered for you to take home. It was not any rejection, we were full. You wanted it, so why not? This dish was supposed to have the egg stirred into it at serving. Nobody at either end of the table did so, though it really doesn't matter. I took home a substantial quantity of chopped red onion, because it seemed a waste to just throw it out. 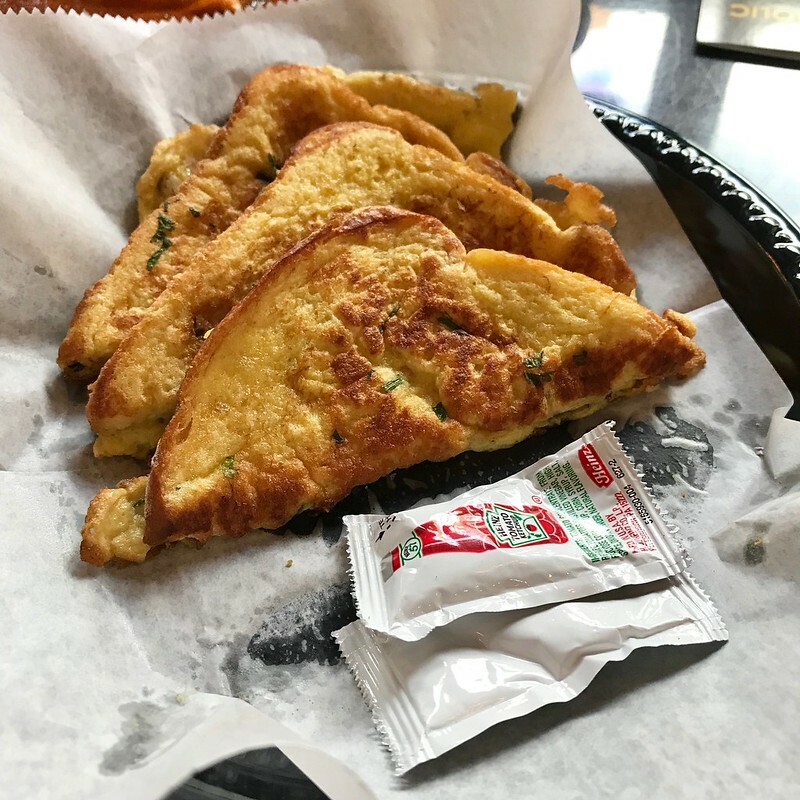 I also took the bread to make French toast. I liked the mint sauce with the chopped eggs, which seemed to look like bitter melon at my first glance. I also really liked the dry crumbly dish. This is the type of meal I come to really appreciate my LTH tribe. There is nobody in my extended group of friends who would check it out. Fortunately, I have you guys! 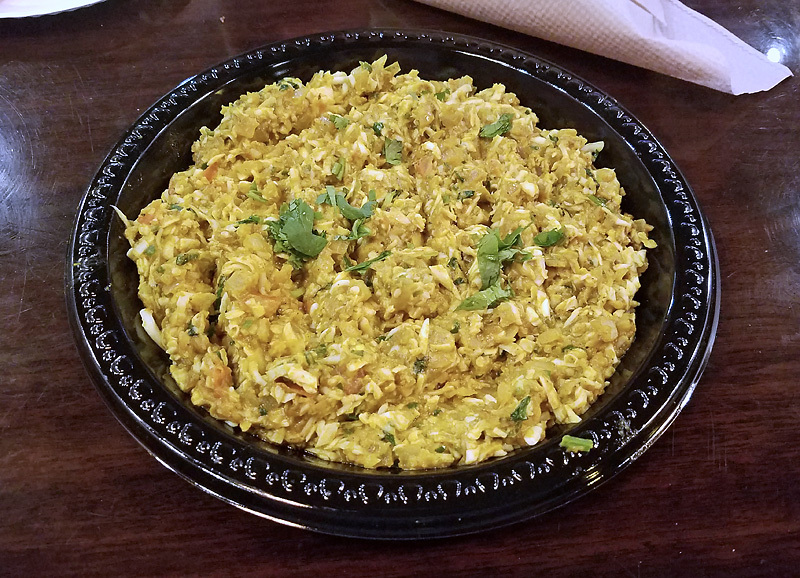 I felt that Egg-A-Holic is one of the most distinctive Indian restaurants around. 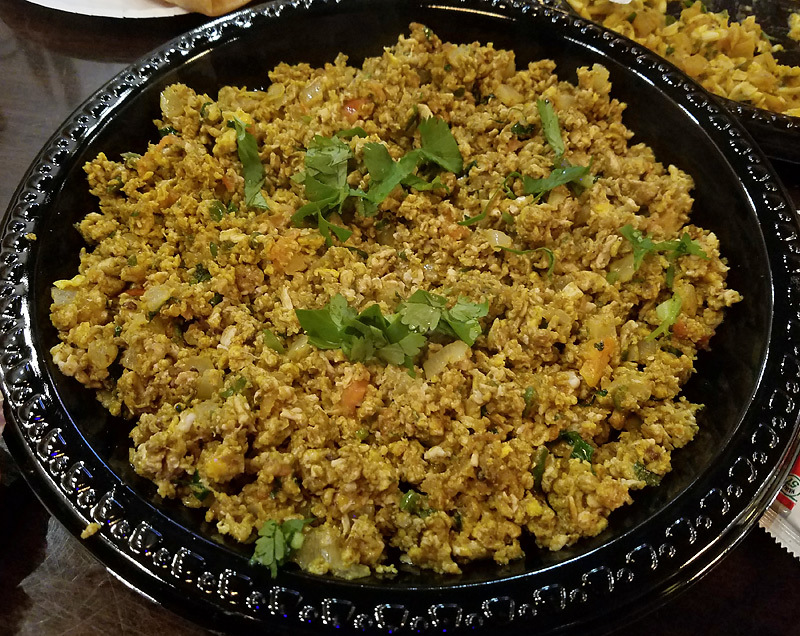 While the restaurant itself (the one in Schaumburg) is not elegant, most of the dishes were unlike other Indian dishes at more conventional restaurants. I plan to return to try dishes that our group did not order. I consider Chicago fortunately to have Egg-A-Holics. GAF wrote: I plan to return to try dishes that our group did not order. I consider Chicago fortunately to have Egg-A-Holics. Agreed, we could make another event to try some of the other dishes. The grilled cheese and samosas certainly sing out to me. 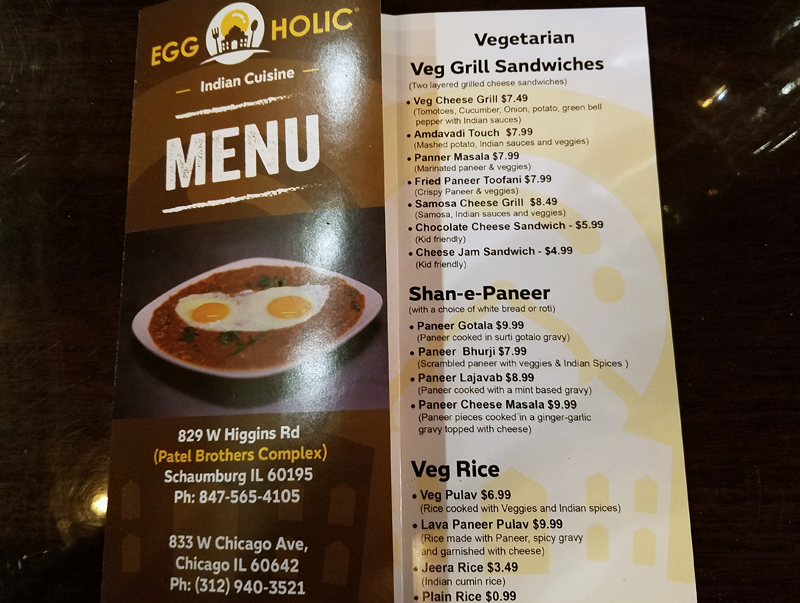 Went to the Chicago location on Sunday and got the anda masala sandwich, surti gotalo, and egg bhurji. All were awesome and I can't wait to go back to try more of the menu. That anda masala is definitely going on my best bites of 2019. The location is a bit weird and I hope it doesn't impact them too much because this is one of the more interesting places to open recently. gnarchief wrote: Went to the Chicago location on Sunday and got the anda masala sandwich, surti gotalo, and egg bhurji. All were awesome and I can't wait to go back to try more of the menu. That anda masala is definitely going on my best bites of 2019. 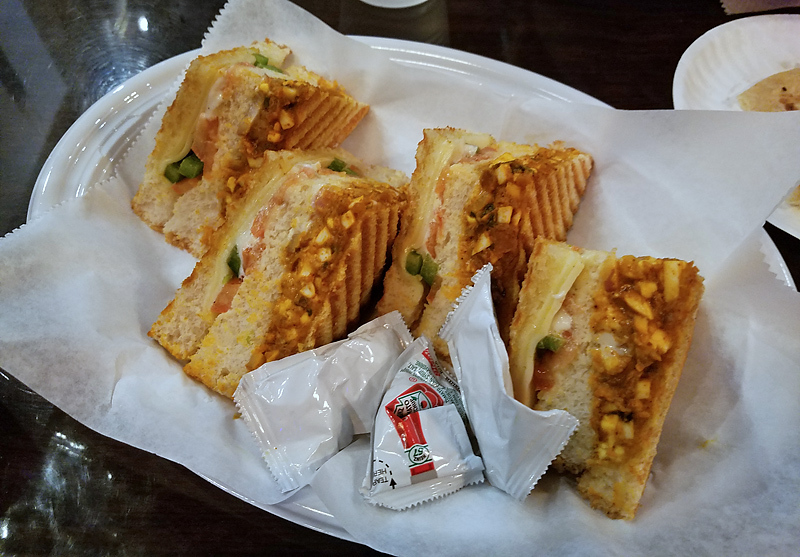 Also loved the same sandwich there and the delicious chai. Hoping the location isn't an issue either, because it's not exactly on the beaten path and it's a very large space! Not sure if parking is permitted in the huge lot behind the restaurant but free street parking can usually be found close by on Green or Superior. 1. Ok, please tell me how to word what I say. I thought I made it clear that I would only take that dish home of nobody else would. 2. Yes, I agree they had different dishes than other Indian places. 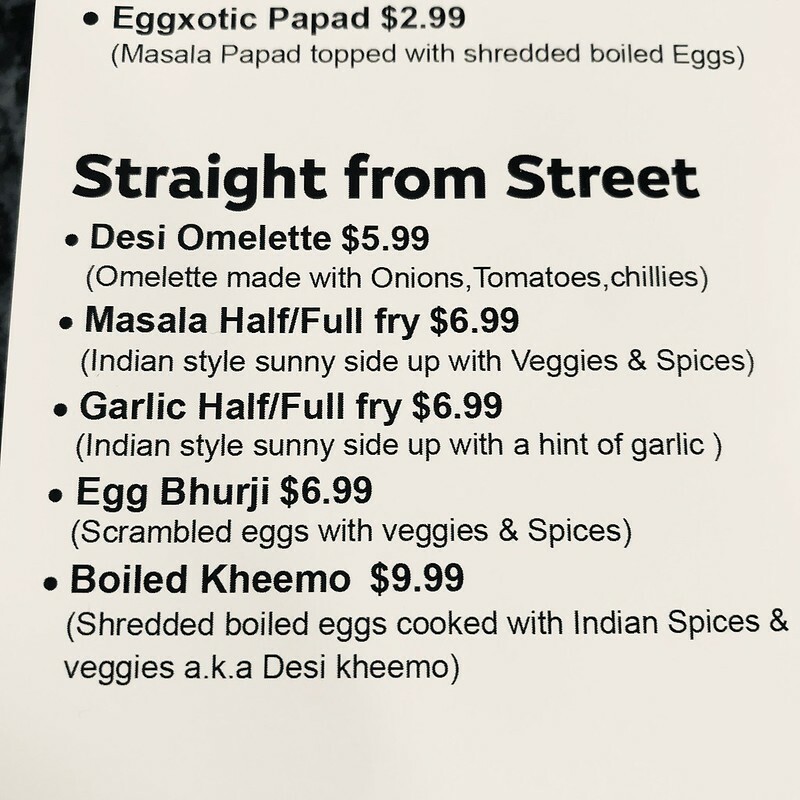 It would be nice if many of them were available at other Indian restaurants, so I could have maybe two or three, along with other kinds of dishes, but to have essentially nothing but egg dishes is not a meal I'd make an effort to consume. diversedancer wrote: but to have essentially nothing but egg dishes is not a meal I'd make an effort to consume. I had my first Egg-O-Holic experiance today and very much enjoyed. Egg-O-Holic, count me a Fan! Ronnie, please note the name is Egg-O-Holic, might want to change the title for easier future reference.